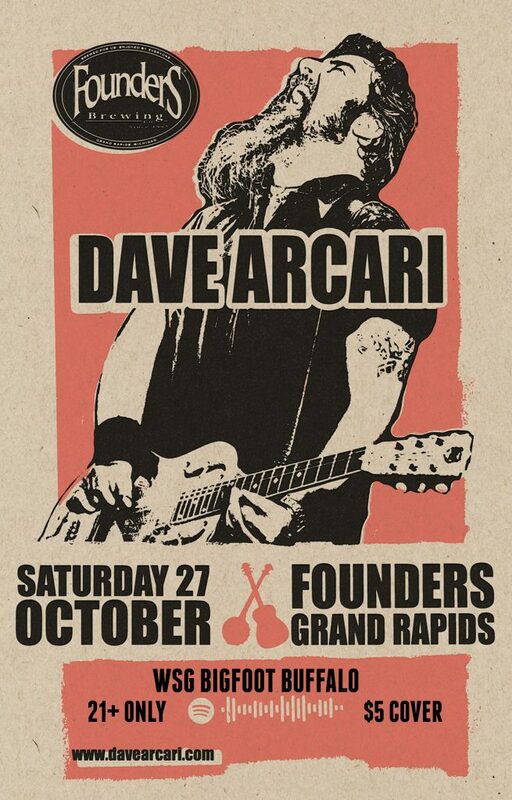 Dave Arcari - Founders Brewing Co.
SLIDE guitarist & songwriter Dave Arcari’s alt.blues sounds owe as much to trash country, punk and rockabilly as they do pre-war Delta blues and have been showcased via nine internationally-acclaimed solo CD releases. Arcari’s new album – Live at Memorial Hall – recorded at a venue close to his home on the eastern shores of Loch Lomond, Scotland, is scheduled for release on 1 September 2017 on Buzz Records. The 2016 Hellbound Train EP entered the iTunes charts at number seven, filling a gap in releases since his last album – Whisky in my Blood – released on Finnish record label Blue North in March 2013. As well as showcasing Arcari’s trademark National steel guitars, the release features performances on banjo, regular guitar and and cigar box which help capture the full breadth of Arcari’s song-writing and performance. 2017 also sees Arcari focussing his live work on UK and Europe having been concentrating on building his audience in the USA over the last few years. His 2016 USA tour built on the foundations laid over successful US tours in 2013, 2014 and 2015 – including official showcases at SxSW in Austin, Texas. With a busy live schedule in the UK plus regular shows in USA, Finland, Estonia, France, Germany, Belgium, Poland and Ireland Arcari is one of the hardest gigging live artists on the circuit. A series of shows with folks including Steve Earle, Alabama 3, Seasick Steve, Toby Keith and Jon Spencer along with his relentless UK and European tour schedule have established Arcari as a formidable international solo performer who is fast building a media reputation as a ‘hell-raising National guitar madman’. A former debt collector, Arcari cut his musical teeth busking on the streets of Glasgow before forming his first band Summerfield Blues which won the Alexis Korner Memorial Trophy and accolade of Scottish Blues Band of the Year at Edinburgh International Blues Festival in1993. He went on to form pioneering alt.blues trio Radiotones, releasing three studio albums between1998 and 2003 before embarking on a solo career. In between times, Arcari also played guitar with Union Avenue – an oddball collective playing least expected covers (think The Clash, Pink Floyd, Undertones, Bob Marley) in a late 50’s/Sun Records-era Cash style. The band landed record of the week on Mark Radcliffe’s Radio 1 show with their version of Motorhead’s Ace of Spades. Bigfoot Buffalo is a Grand Rapids, Michigan band with refreshing tunes and live performances that are full of energy, passion, and dynamic excitement. The band fuses their musical roots of Folk, Rock, Americana, Jam, Funk, Bluegrass, Blues, and Country to form a truly unique sound.Their repertoire ranges from psychedelic rootsy journeys to country and blues inspired tunes, to reinvented covers to folk rock songs steeped in Americana . Referred to by John Sinkevics (Local Spins) as “an eclectic jam band” with “powerful songs”. Their debut LP was released in August of 2015, followed by the release of their live EP “Thanks Y’all” in July 0f 2016,and their 2nd LP “The Sun Is The Moon” in October 2017!